The 2004 Nobel Peace Prize went to the Kenyan environmentalist, Wangari Maathai (may her soul rest in peace), best known for organizing a grassroots movement in which thousands of people were mobilized over the years to plant 30 million trees in Kenya and elsewhere and to protest forest clearance for luxury development. Imprisoned as an opponent of the former president Moi, Maathai linked deforestation with the plight of rural women, who are forced to spend untold hours in search of scarce firewood. Deforestation practices are turning large areas of the planet into deserts. The earth is quickly eroding and warming up and the natural balance is being seriously disrupted, with water scarcity, failed crops, hunger, poverty, migration, natural disasters and climate changes as a result. Availability of both service and productive functions to communities who depend on forest resources in Meru South region has been decreasing annually due to increased number of human activities. The activities have mainly been exploitation of timber and firewood. A research on human activities influencing deforestation on Meru Catchment Forest Reserve carried out by researchers from the Forestry Training Institute of Tanzania show that the main human activities disturbing the forest are firewood collection for commercial and family use (21 per cent), and illegal lumbering etc. The research recommends that awareness and capacity building on participatory forest management to communities adjacent to the forest could have social and economic incentives for conserving forest resources. The Meru South Improved Cook stove Project is a project is fully sponsored by Co2balance and was started in 2011. It is located in the Meru South District of Tharaka Nithi County a place famously known as Chuka. Co2balance team with full participation of local area leaders saw the dissemination of 8000 ICS in the area. The area is adjacent to one of the five water towers in the country; a tourist attraction site due to its heritage and environmental importance. 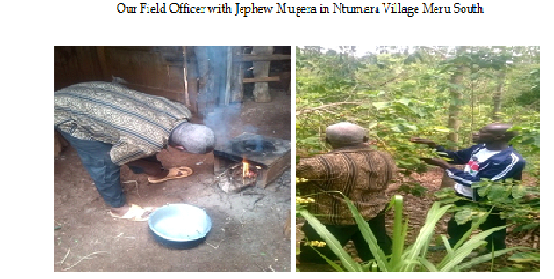 More than 90% of rural families in Meru south use wood fuel to cook. The cost of wood fuel has escalated due to deforestation. Consequently, the families spend a big percentage of their income purchasing wood fuel. Besides the high expenses in wood fuel, another problem of cooking over open fire is the increased health problems brought by smoke such as lung and eye ailments. From a distance as you approach Ntumara Village in Chuka, clear lands are observed, which an indication that there are few trees near the bordering forest. The locals explain that many trees were brought down for firewood while using the three stone stoves. Due to the high demand of wood product, the locals were strained to cut down immature trees for firewood. Firewood has become a rare commodity in the area. The few trees in the farms are exotic e.g. silk oak (grevillea robusta) and tomato tree (Solanum lycopersicum) which serve as fodder and tomato tree produce fruit among other exotic trees. Indigenous trees are also very rare in this village. The objective of Co2balance ICS project is to reduce the pressure placed on local forests by reducing the amount of firewood fuel consumed during cooking. Additionally, the money a family spends on wood is reduced considerably. This translates into money being available to be spent on food, education and medical care. Education on optimal stove usage is provided by the Co2balance team. Beneficiaries’ education is conducted to individuals, women groups and in local chief’s barazas and covers from lighting, effective wood loading for optimal stove usage. He also adds that it is easy to use the stove as he requires less firewood compared to the three stone jiko. 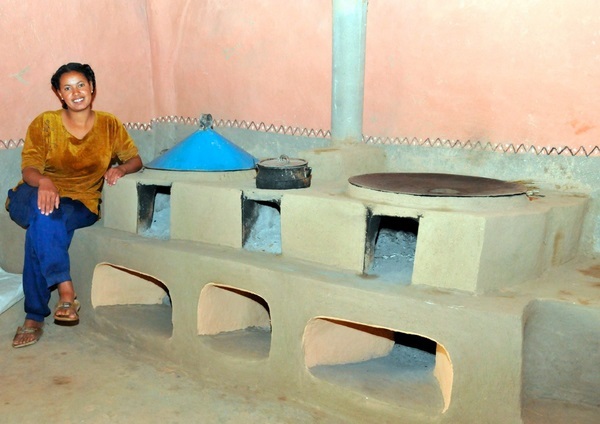 He compares the three 3-stone stove with a giant which consumes much than it needs and expresses his gratitude to Co2balance for considering his village for the project. As a result of its pioneering global micro Programme of Activities (mPoA), co2balance are assisting partners develop projects in countries that have yet to see much benefit from carbon finance initiatives. The most recent addition to our PoA is GS 4036 which is the second cookstove VPA in development in Zoba Anseba, Eritrea. This VPA implemented along with our partners Vita an Irish Charity, involves the development of improved “Mogogo Stoves”, unique to the Eritrean way of life. Gold Standard last week confirmed that this second VPA was officially listed. 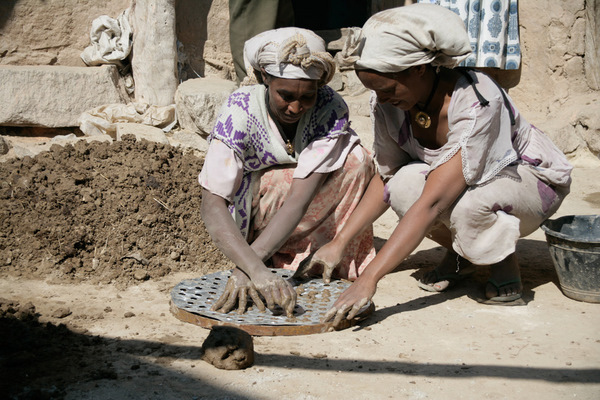 Currently on the ground in Eritrea, our partners Vita are constructing hundreds of stoves per month, using womens groups (see image). It is an exciting time. Our managing director, Mark Simpson is in Eritrea presently visiting the Vita team and local communities and we look forward to news from the front and stories from villagers upon his return to the UK. Watch the space. With a deadline set at 5th December 2015, we are due to enter the final 6 month countdown until compliance with the 1st phase for ESOS (Energy Savings Opportunity Scheme) must be demonstrated by qualifying organisations. ESOS is the UK Government’s response to an EU Directive that requires so-called Large Undertakings to undergo energy audits and identify energy savings opportunities within their operations. In case you were wondering what exactly a Large Undertaking is, it is defined as an organisation of more than 250 employees or an organisation with a turnover of €50 million and a balance sheet of more than €47 million. In contrast to prevailing thought, this criteria means that you don’t always have to be a for-profit business to fall within scope – trust funds, major charities and universities receiving over 50% of their funding from private sources are examples of Large Undertakings that will have to comply with the scheme. Typically, an organisation has to demonstrate their compliance with ESOS by contracting a qualified Lead Assessor to oversee their energy audits and identify energy savings opportunities. At last count, there were only 300 registered Lead Assessors and an estimated 7,500 Undertakings falling within scope of ESOS. This is very likely an underestimate of the actual number of Undertakings that will have to comply – owing to the fact that all organisations under the umbrella of a UK parent group will fall under ESOS if only one of its fellow organisations met the ESOS qualifying criteria. As a registered Lead Assessor, CO2balance are expecting busy times in the coming 6 months and are fully prepared for the last mad dash to meet the deadline – if you unsure whether your organisation is within scope of ESOS, feel free to drop us a line and we will be happy to provide you with some advice. Forests are the lungs of the earth. The air we breathe, the stability of our climate depends on forests. They’re home to around two-thirds of all plant and animal species found on land and millions of people depend on them for survival. Without healthy, thriving forests, planet Earth cannot sustain life. Yet our forests are being destroyed at an alarming rate. Despite their immense value to humanity, nearly half of the world’s forests have been lost. What’s worse, we’re cutting them down at greater rates each year for firewood, plant crops, graze cattle etc. Shimba Hills Forest is a National Reserve that lies approximately 33km south of Mombasa town, in Kwale district of coast province. The coastal ecosystem comprise of a heterogeneous habitat including forestlands, exotic plantations, scrublands and grasslands. The ecosystem holds one of the largest coastal forests in East Africa after Arabuko-Sokoke forest. The reserve is rich in flora and fauna and hosts the highest density of African elephant in Kenya. The reserve is an area of coastal rainforest, woodland and grassland. It is an important area for plant biodiversity – over 50% of the 159 rare plants in Kenya are found in the Shimba Hills, including some endangered species of cycad and orchids. It is also a nationally important site for birds and butterflies. Forests provide a buffer to filter water and to hold soil in place. They sustain water and soil resources through recycling nutrients. In watersheds where forests are degraded or destroyed, minimum flows decrease during the dry season, leading to drought, while peak floods and soil erosion increase during the wet season. In Shimba Hills forest the local people have the right to use forest resources for domestic purposes but not for commercial purposes. As results the residents have taken advantage of this gap hence the forest has suffered substantial vegetation loss and degradation since the early 1960´s. Especially since the forest is a major source of firewood. Due to the insatiable need for wood fuel many trees have been cut as people seek fuel for cooking their meals at home on the wood extravagant traditional three stone. These uncontrolled anthropogenic activities endangered the existence of this very vital forest. Carbon Zero Kenya with the understanding that logging forests for wood fuel contributes to global warming through removing significant sources of sequestered carbon started working with local communities within Shimba Hills forest to salvage the forest through the distribution of energy efficient cook stoves. Carbon Zero stoves have seen the facing out of the “wood extravagant” traditional three stone stoves within the area. This has resulted in immense savings in terms of the wood being used for cooking ultimately reducing pressure on the forest giving it a chance to restore itself for the past four years. The Carbon Zero stoves beneficiaries within Shimba hills are so happy with fuel use reduction giving them ample time do to engage in other economic activities i.e. Domestic farming which generate surplus income. They are also enjoying health improvement especially the big percentage reduction of smoke related infections. It’s a fact that people need forests and that’s where all human beings come in. When you acquire and use an energy efficient cook stove you save a lot on wood fuel which transforms into saving of forests thus helping create a healthier, more prosperous, more productive planet, for you and for everyone.